So you've installed the bathroom vanity and painted the wall, but there still seems to be something missing. In order to create the look you desire, you still need to accessorize to make your space appealing. 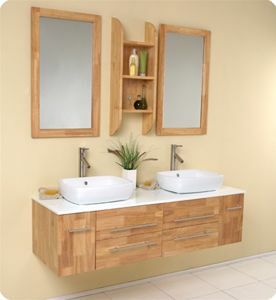 Because your bathroom is a small space, it's actually easier to put together a look that will be cohesive. To complete the makeover, think about a theme that you might want in there - just don't be too literal with the bathroom accessories. If, for example, you were thinking about creating a nautical scene, hanging several anchors on the walls and installing a shower curtain adorned with a beach scene may seem too severe. Instead, opt for a more subtle way of showing your love of the sea. Besides a blue accent wall, choose bathroom accessories such as a vase and fill it with some sand and shells. Throw your favorite scented candle inside and place it on your bathroom vanity for a sophisticated take on the beach theme.